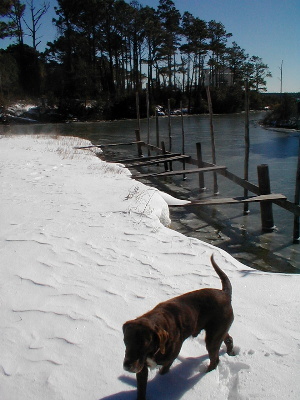 February 12, 2003 A late January snow blanketed the coast and ice chunks flowed out of creeks and cuts into the sound. 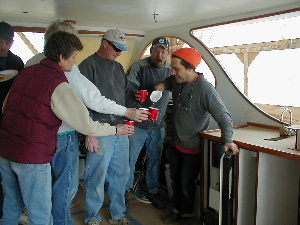 A bundled up crew warmed up Cherokee with lots of trim and varnish, a tank of fuel, and new flybridge walls. 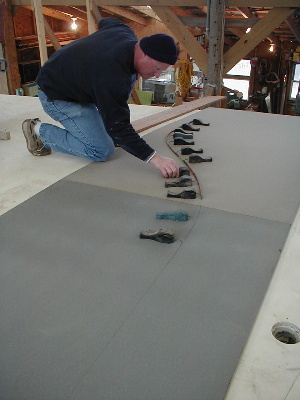 Below, Leonard is faring the line of the flying bridge wings with battens and lead weights atop Divinicell panels. 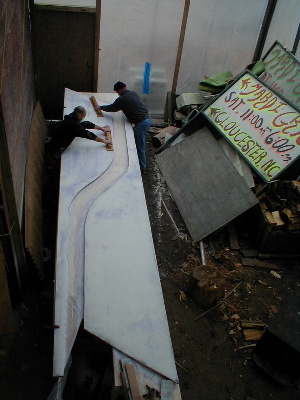 Once the sides were cut, Leonard and Chris got busy gluing together the two half-inch panels, fiberglassing, microballooning, and board sanding them flat. 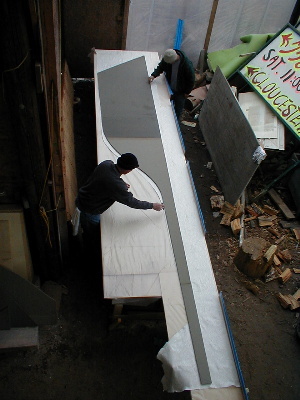 Note signs of February to the right – chopped wood for the stoves, and Mardi Gras signs ready to post. 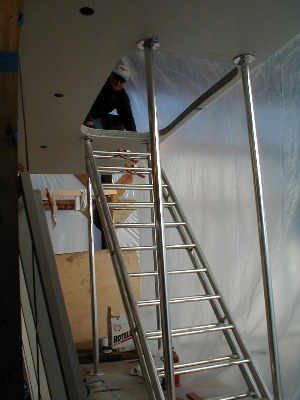 Other “up-top” action includes a hole cut into the hardtop, making it much less painful when you get to the top of the stairs. Eastern Oil and Tire brought a tanker out and put 800 gallons in the Cherokee in anticipation of the engine getting cranked. 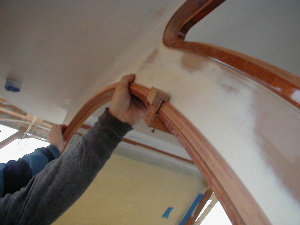 Tom Parker is working on mahogany trim for the pilot house sides and rear windows. 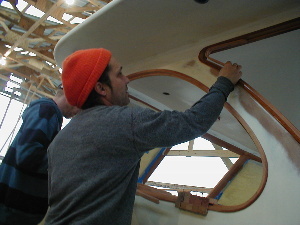 Above, Bryan checks the perfect fit of the outer window keepers that Tom has built. These keepers will hold the glass in place. To the right Bryan is inspecting the bent pieces with “Tom the Tool Man’s” specialized wood clamps. 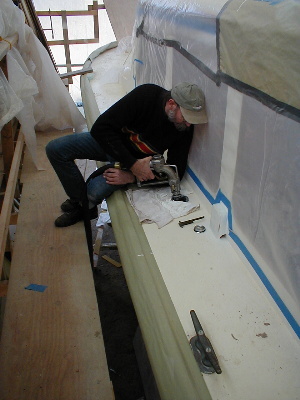 The window trim is completed in the pilot house, shown below, softening the metalic look of the support poles. 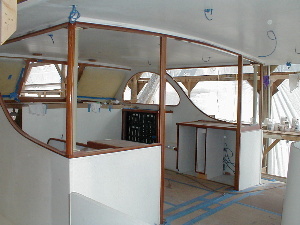 The next step will be preparing luan 1/4 inch plywood patterns for the glass cutter. All systems are not “go” yet, but they’re getting there! 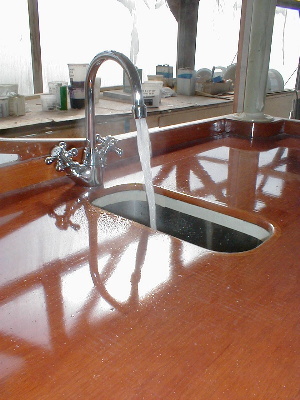 The watermaker, as illustrated below, is working swimmingly. What’s your preference, hot or cold? It has the ability to make up to 800 gallons of drinking water per day, from city water, well water, salt water – any kind of water! 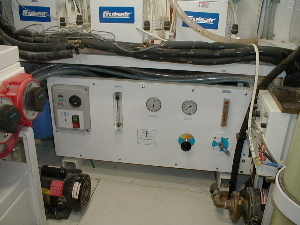 The system uses reverse osmosis (a mini R.O. plant), forcing water through a membrane so fine that only particles the size of water molecules can get through. Cary Excited about R.O. Ice!